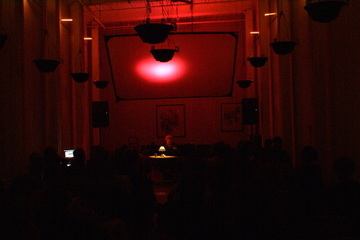 Tuesday night, I visited Issue Project Room for a solo performance by Robert Ashley, one of the leading figures of the downtown NY music scene in the 60's and 70's. He is best known for his "operas": multimedia works that are, "so vast in their vision that they are comparable only to Wagner's Ring cycle or Stockhausen's seven-evening Licht cycle." He is widely credited as the father of music television, primarily for his 1980 made-for-TV opera Perfect Lives. "A LAST FUTILE STAB AT FUN is a 'lecture to be sung' with accompanying sounds. The text was written in 1979 as a lecture for the Walker Art Center and has not been done since or otherwise... It produced a kind of what-are-we-talking-about set of logical conclusions that came from I don't know where. It digressed into other questions of things I was thinking about then. Finally in 2008 I got it into a metered form as a 'lecture to be sung.'" 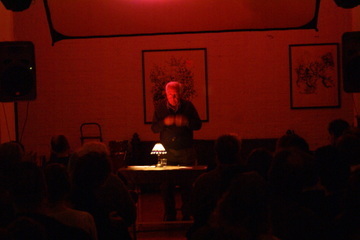 Ashley read at a small table, his amplified and electronically-altered voice supplemented with samples that sounded like souls trapped in hell. (The point was driven home with the blood-red lighting.) I missed most of the performance, but heard enough odd snippets to get the gist. The audience, about 80 strong, gave Ashley a sustained ovation once he finished. There is some exciting news concerning the future of Issue Project Room, which has been plagued by lease issues for years. I'll provide details as soon as it's confirmed. I'm not usually in the habit of shilling for institutions, but if you haven't done so already, you really need to get on sending in your pledge to WFMU. I just heard Tony Coulter and Scott Williams talking on air, chiding our other public broadcasting institutions who hold multiple annoying fund drives every year, with a good chunk of the proceeds going to pay the overinflated salaries of their top executives. (Yes, Laura Walker, they meant you.) These guys hold one fundraiser a year, because to do more, as Coulter puts it, would mean "selling their souls." (In case you were wondering, all the DJs at WFMU are volunteers.) As a result, they barely raise enough money to keep the lights on: Williams said there was a leak last year right over the turntables, and instead of calling a contractor to come fix it, they used a rain bucket. For two months. Sounds like my old college radio days...You can use the pledge widget I pasted in a couple of posts down, or call them up at 800-989-9368. C'mon, you know you want that T-shirt. Also, there will be a second benefit for musician Andrew D'Angelo at Barbes tomorrow night, starting at 8p. Judging from the overflow crowd that packed the much larger Tea Lounge last week, my advice to you is: Get there early. And, be generous. 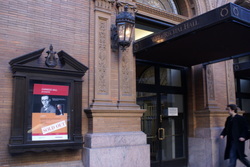 I'm a bit too young to have met Olivier Messiaen while he was still alive, but the Messiaen Discovery Concert in Weill Recital Hall Sunday afternoon brought the man many consider to be the greatest composer of the 20th Century pretty close to life. When I arrived - late, as usual - British pianist and Messiaen scholar Peter Hill was speaking about the time he first met Messiaen at his Paris apartment in 1986. Messiaen showed him a small, antique chair, which collapsed underneath Hill the moment he sat in it. "A rather awkward beginning," Hill said. Hill went on to become good friends with Messiaen over the last five years of his life, indulging his love of English poetry and bringing him coffee table books of birds. 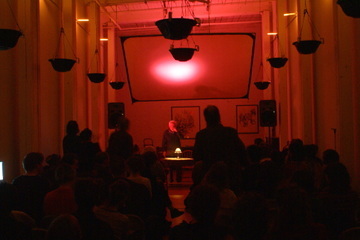 He played a recording of one of Messiaen's recessional improvisations at La Trinité Church in Paris, which sounded more conventional than his composed works for organ but sufficiently captivated the audience to keep them in their seats till the end. 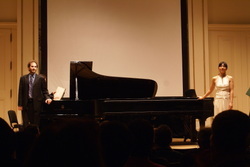 Hill concluded by saying that Messiaen's final work, Eclairs sur l'au Dela was, "without question his orchestral masterpiece." 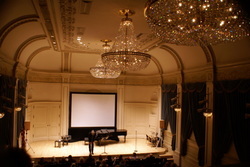 He made note of the fact that it was commissioned by the New York Philharmonic, but was surprised not to see it on the calendar for either this season or next. "If the New York Phil isn't performing it this year," Hill said, "you should all immediately besiege them with requests to do so." The film also focused on his fascination with birds, following him out into the field where he would transcribe birdsong into musical notation, much of which would eventually find its way into his compositions. "It is very challenging," he said. "I need to remember the first phrase while listening to the second. The bird doesn't wait for me." This fascination with birdsong also revealed Messiaen's more eccentric side, showing him whooping and crowing like some kind of madman. His wife, Yvonne Loriod, looked on admiringly, plucking out the notes and rhythms on their home piano. 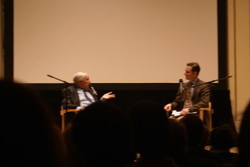 "When he first entered class, (Boulez) was very nice. But soon he became angry with the whole world. He thought everything was wrong with music...He was like a lion that had been flayed alive, he was terrible!" "So, for your generation of composers that came of age after World War II, how yould you evaluate Messiaen's music now?" 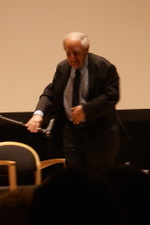 "Well, I can only speak for myself," Boulez said. "I cannot speak for Berio, for Stockhausen: they are no longer with us. But, I will admit that I don't like everything Messiaen did. I do not care for his use of bird calls. I don't care for much of his harmonics. I prefer Poemes Pour Mi to, say, Turangalia-Symphonie. But, that is a purely personal point of view. Music should navigate between order and chaos, and with Messiaen, I feel that gap is never bridged." "Well, I think that's a lovely way to leave our conversation," Geffen said. Lovely? More like someone left a pile of manure onstage. "a chorale of glory, a ceaseless carillion of chords and brilliant, scintillating rhythms...the whole rainbow of precious stones mentioned in the Apocalypse: sounding, jarring, dancing, coloring, and perfuming the light of eternal life." Mizrahi and Roe received a well-deserved ovation, sending everyone out onto 57th Street with a trance-like glaze in their eyes. 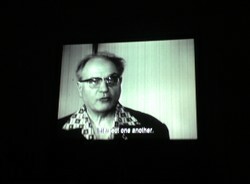 Boulez said that Messiaen often lamented there would be noone to take up his sui generis mantle after he passed. I hope that won't forever be the case: we could stand to hear more of his wide-eyed wonder. P.S. As incredible as last month's LA Philharmonic performance of From the Canyons to the Stars...was, I spent most of it sitting on the edge of my seat, wondering whether or not I was going to make my redeye out of LAX. Fortunately, I'll have the chance to hear it again tonight, as performed by Juilliard's Axiom Ensemble at the Peter Jay Sharp Theater on 65th Street. And, oh yeah, tickets are free. 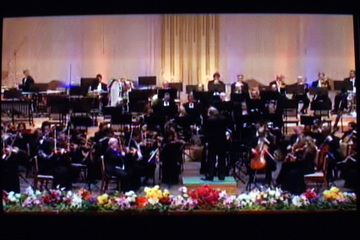 4:08am: The Philharmonic has taken the stage, and is playing both the North Korean and American national anthems. They play both standing up, from memory. Impressive. The hall is filled with party officials, but no Kim Jong Il - at least not in plain sight. 4:14am: After playing Wagner's Prelude to Act III of Lohengrin, Maazel speaks from the stage, introducing Dvorak's New World Symphony. He tells everyone that the Philharmonic commissioned and premiered in 1893. He finishes by speaking a brief phrase in Korean, to the audience's delight. 5:00am: Continuing without an intermission, Maazel introduces the supposed final work on the program, An American in Paris. "The next piece we will play for you was written by America's most famous composer, George Gershwin. Someday, someone may well write a composition called Americans in Pyongyang." Gershwin? What about Copland? Or John Adams? Whatever: the crowd applauds loudly, though politely. 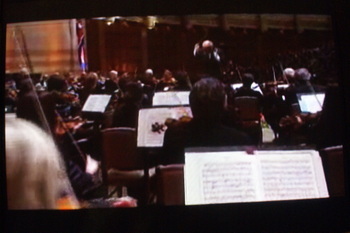 Maazel says something else in Korean, then launches into the Gershwin, sounding bright and jazzy. 5:23am: After a rousing, almost propagandist-sounding rendition of the "Farandole" from Bizet's second L'Arlésienne Suite, the American contingent traveling with the Philharmonic, sitting towards the back of the hall, hesitantly rise from their seats. 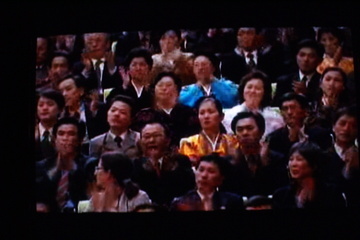 The Koreans in front do not move at first, politely applauding in their seats. Eventually, however, a few begin to stand, and then a few more until finally the entire hall stands and applauds. An incredible moment. Maazel introduces Bernstein's overture to Candide by reminding us that Bernstein often used to conduct the work himself when he was director of the Philharmonic, and asks us "to imagine him joining us once again for this concert." He then says "Maestro, take it away!" in Korean and walks offstage, leaving the Philharmonic to perform with an empty podium. I am crossing over Arirang Pass. Will not walk even ten li before his/her feet hurt. There are also many dreams in our heart. Where, even in the middle of winter days, flowers bloom." After, the entire audience stands and applauds, without hesitation. A few cheers come from the American section. 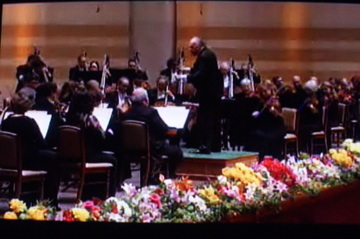 Maazel is handed half-a-dozen bouquets, and he immediately hands one to Associate Concertmaster Michelle Kim, a Korean native. 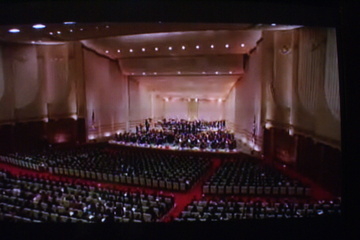 The Philharmonic waves goodbye from the stage, and loud "bravos" ring out. Maazel comes out for one final bow standing next to Concertmaster Glenn Dicterow, smiling widely. 6:11am: Okay, I'm going back to bed. More images after the jump.